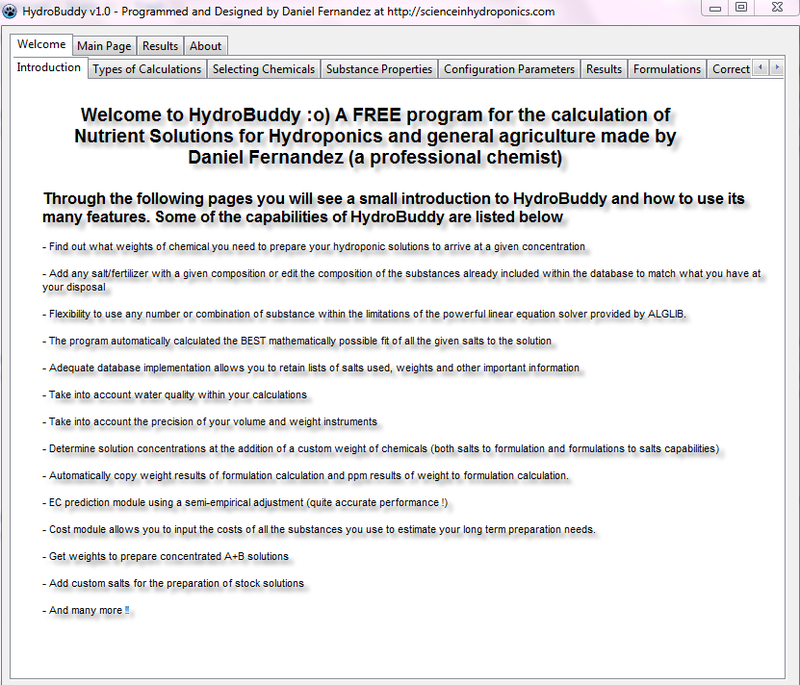 Through the past few months its been very quiet here at scienceinhydroponics.com mainly because I have been very busy with the development of the latest version of HydroBuddy as I mentioned within my last post. Through the past few weeks I have worked many hours on this new implementation and I am glad to say that the results are almost ready for me to show :o) Within this post I will talk to you about some of the many improvements of this new version of HydroBuddy as well as what I will be removing, some of the changes I have introduced and the many and great advantages of this much more robust program. The first thing I want to mention - which I am very happy to announce - is that HydroBuddy has now been coded again (from the ground up) so everything is new and done in a much better way :o) Probably many of you will be happy to know that HydroBuddy has been in fact implemented within Lazarus, making it available now natively on Linux and Mac as well as Windows. Although I haven't tested the Mac or Linux binaries I can say that it doesn't use any windows proprietary components so it should work right away on most regular linux and Mac implementations. There are certainly a ton of improvements that I have implemented within this new version of HydroBuddy, redesigning the way in which everything was coded to be more transparent and efficient. Perhaps the most important change is the implementation of an adequate database system so now we don't need to handle all those nasty text files and do things in the primitive way in which HydroBuddy was doing them. Although the program did its job - for the most part - the implementation was too inflexible and everything was "hard coded" -- so to speak. 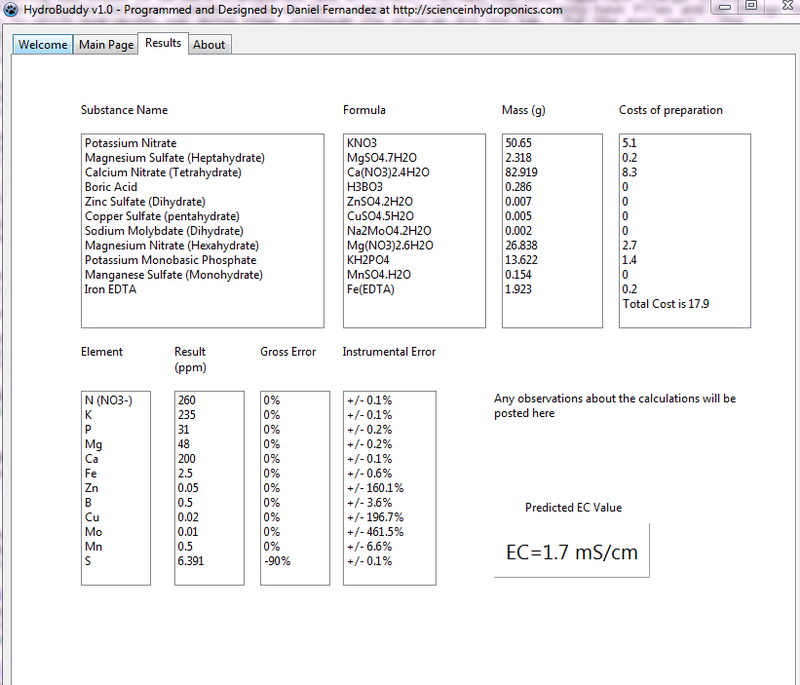 The new database flexible implementation allows you to add or edit the composition of any of the salts included within the program and even to use custom salts within concentrated solution preparations. The next improvement - which is the one I like the most - deals with the introduction of a much more powerful linear equation solver which allows us to fully exploit the power of our computers to carry out the simulations. Previously HydroBuddy used a very primitive solver which was "scotch tapped" with many different manual rules to make it yield adequate results. Of course the problem of this - as many of you discovered - was that HydroBuddy was "picky" about its choices and it wouldn't use two salts with Mg - for example - if it was already using one. Now the new solver is a very powerful AlgLib implementation which allows the program to find the best mathematical solution for a formulation, making sure that you get the absolute best possible case out of all the salts you choose. The "salts used" tab has also been eliminated in favor of a much more convenient implementation which allows you to simply select salts from a list and set which ever values you want. Another advantage of the database implementation is that any choices you make will be saved and there for you when you reopen HydroBuddy. The program also implements database components to save formulations, water quality parameters, etc, making it much easier to get into previously saved data without the problem of having to read text files (which was a very bad decision for HydroBuddy in retrospective). Another things you guys might like a lot is that I have added "hints" to almost all important buttons so hovering your mouse over things will now make them show you what they do. Another improvement is the addition of a tab with descriptions and tutorials, allowing you to get to know the software very well without having to open up a website, "copy and paste URLs" or any other such stuff. To sum it up, HydroBuddy v1.0 is coming and it will be a very positive change for this very useful - at least in my opinion ! - piece of software :o). The fact that all software components are much more transparent now will also make it much more eligible for academic use, something which I also want this program to be about :o) So its coming ! And its coming soon !